Brushing your teeth doesn't have to be boring, as you aren't restricted to just using a standard, straight brush to clean your teeth. Advances in dentistry and technology have resulted in the creation of several great options, and there are a few on the market that you'll be dying to try once you learn more about them. These are three of the top. Many people enjoy brushing their teeth in the shower, and there is a great toothbrush that can make this process even easier. This brush hangs directly from the shower head so that you have convenient access to it whenever you want to brush. This keeps your brush clean, safe, and free of unwanted germs. This is also a great option for storage problems. Does it gross you out to put your toothbrush on the bathroom counter, especially when you think about all the germs that it can encounter? This DEWS toothbrush has eliminated those concerns with an upstanding toothbrush that creates a center of gravity with the weight at the end of the rounded handle. The weight helps to keep the brush balanced so that it never touches anything it shouldn't. 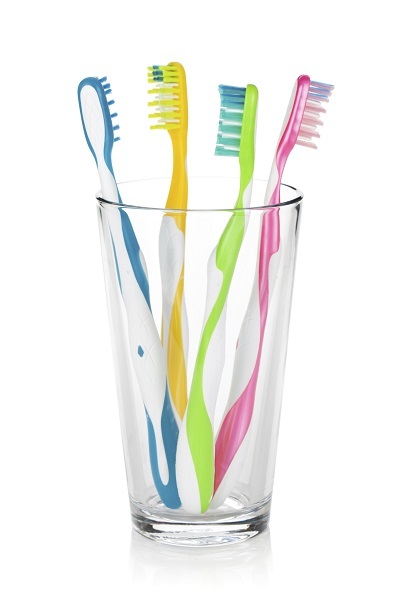 Are you tired of having to rinse your mouth out with a dirty old cup every time you brush? Are you tired of getting toothpaste on your hands when you rinse with your brush? The Brush and Rinse toothbrush can change all of that by directing water from the faucet and into your mouth in order to easier rinse. It is a great option for when you are camping, traveling, or in any other situation in which you are cramped for space. Are you in need of a new toothbrush and want some suggestions? Contact our office today.